Battle for survival: Who will Hearts field in the starting XI next season? A look at the 22 players charged with putting a dent in the club's 15 point league penalty. They have an average age of less than 22 and only three members of the team have made more than 100 senior appearances in football. This is the Hearts team of 2013/14 that Gary Locke must craft into a side that can overcome a 15 point deficit and avoid relegation. With an embargo over registering new players hanging over Tynecastle indefinitely while the club is in administration, Locke has a pool of just 22 names with which to put his team together. After Jamie MacDonald, Jamie Hamill, Ryan Stevenson and Kevin McHattie agreed to wage cuts and the addition of Danny Wilson also on reduced terms, Locke was able to retain much of his squad – but is unable to add further experience due to a registration embargo. Administrators BDO allowed John Sutton to leave Tynecastle, while Andrew Driver and Marius Zaliukas are undergoing a redundancy process on the short remainder of their contracts. In addition, youth players Mark Keegan and Marcus McMillan have left Hearts. It leaves the likely starting XI with an average number of senior club appearances of 88 and a total of 98 goals between them – with more than half of that number scored by Ryan Stevenson. The 27-year-old has good experience despite only claiming the number one jersey full time in 2011. MacDonald was a Scottish Cup runner-up during his 2008 loan spell with Queen of the South, and claimed a winners’ medal in 2012 with Hearts. The former Kilmarnock utility man brings experience and leadership in a number of potential roles, having played full back, wide midfield and central midfield for Hearts. The 26-year-old has taken a 50% pay cut to stay at Tynecastle, citing unfinished business in maroon following a 12 month spell out with a knee injury. The Australian brother of Hearts cup-winner Ryan has played midfield and full back roles since breaking into the Hearts side under John McGlynn. McGowan, 21, impressed at centre half in matches against Hibernian and St Mirren last season following loan spells at Gold Coast United and East Fife. At just 21, Wilson will captain the Hearts squad following his protracted Bosman move from Liverpool. The ex-Rangers defender has five Scotland caps and will be called on to lead the similarly youthful McGowan and McHattie either side of him in the Jam Tarts back line. The left back featured heavily in the first team last season after the serious knee injury sustained by Danny Grainger and broke into the Scotland Under-21 team. The 19-year-old has been subject of transfer speculation as Hearts looked to bring in cash prior to entering administration and is considered one of the brightest talents in the current crop of academy players. The ball playing midfielder was recruited from Tottenham Hotspur in 2011 and made his debut in the League Cup semi final victory over Inverness. The 20-year-old began the year on loan with Alloa and ended it earning his first Scotland Under-21 cap, against Greece. The youngest player to appear for Hearts, appearing as a substitute aged 16 years one month and 14 days in 2008, moved from playing as a striker back to the centre of midfield. A combination of form and injury has made for a stop-start career so far for the 21-year-old. 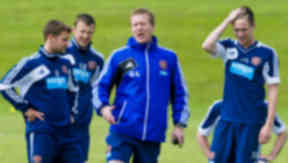 A deft creative player, Holt is another of the Hearts youngsters to earn Scotland Under-21 recognition in the past year. The 20-year-old from Musselburgh managed to hit four goals in his breakthrough season last year. Another of the Riccarton products with an impressive physique despite being just 18-years-old, Paterson has played all over the field for Hearts’ youth teams. After stints at right back and centre forward, Paterson reverted to right midfield where he appeared most comfortable. A foot injury ended his season prematurely but he is regarded as one of the top prospects at the club. A tricky winger in the mold of David Templeton, Walker likes to cut inside and test goalkeepers with his right foot. 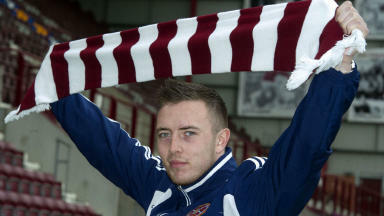 The 20-year-old spent much of 2011/12 on loan to Raith Rovers and returned to Hearts last season, making 24 appearances. Walker struck a fine goal on his Scotland Under-21 debut against Luxembourg in March. Back in his second spell at Tynecastle, Stevenson will be the senior member of the squad at 28-years-old. Stevenson moved to Hearts 2010 from Ayr United and became a hit with fans before transferring to Ipswich Town in 2012 in the midst of Hearts financial woes becoming public. The utility man, who can play across the midfield and up front, returned to Hearts in August last year.